In the eastern provinces of the Democratic Republic of the Congo (DRC), the judgment handed down on 14 March 2012 by the International Criminal Court (ICC) in the Lubanga case shared the headlines with a story about new fighting in Masisi, North Kivu province between the national defense forces FARDC (Forces Armées de la République Démocratique du Congo) and the “Maï-Maï APCLS” and “Pareco Fort,” two of the newly created militias still roaming this part of the country. Local media sympathetic to the central government of Kinshasa reported that the FARDC inflicted big losses on the two rebel groups. Masisi is where Bosco Ntaganda’s Congrès national pour la défense du peuple (CNDP) rebel group started its ascent to criminal fame in 2007, the year Thomas Lubanga was transferred to the Hague to face charges for crimes committed in the neighbouring Ituri district. While the trial in the case against Lubanga was underway, his former aide de camp Bosco Ntaganda was rising in the shadows of Laurent Nkunda, the most flamboyant rebel leader of the post-2006 election period. Bosco Ntaganda, whom the ICC later charged with the same crimes as Lubanga, has now metamorphosed into a regular FARDC officer. He is the de facto overall commander of the Eastern theater and, therefore, he can claim credit for the big FARDC victory reported on the same day as the Lubanga judgment. Something terribly wrong must have happened for the first judgment in the history of the ICC to be overshadowed by the news glorifying the military prowess of a fugitive wanted by the Court but now working as a respectable army general for the same government that turned Lubanga over to the Court. Such a turn of events could have never been predicted ten years ago, when the Court’s intervention was sought as more than just an instrument of justice, but a potential tool for peace for the victims of the war that was pitting the government of Kinshasa against several armed groups scattered across the vast national territory.1 The Kinshasa government has its share of responsibility, having very cleverly used the ICC for its own political expediencies by turning its enemies over to the Court while shielding its friends from international prosecution. But to understand how what was one of the most fertile grounds for international justice in modern times was squandered so quickly, one must turn to the actions of the Court’s own prosecutor and the succession of faux pas and ill-advised decisions he took in the course of the investigation into the Lubanga case. The transitional government formed in July 2003 engaged in an internal debate on the implementation of the recommendations of the “Global and Inclusive Accord” agreed at the 2002 Inter-Congolese Dialogue. On 25 September 2003 the transitional government approved a decision to refer war crimes and other international crimes committed throughout the territory of the DRC to the ICC, and to request the creation by the UN Security Council of an international special tribunal for the DRC to deal with crimes that would fall outside the jurisdiction of the ICC. Remarkably, this decision was reached by a government composed of leaders of armed groups and factions whose own conduct would be the object of investigations by any international criminal tribunal. As articulated thus, the prosecutor’s theory of complementarity found a positive echo in the DRC. The national consensus achieved at the Inter-Congolese Dialogue around the need for a special international tribunal for the DRC had now extended to the need for the intervention of the ICC. Such a broad agreement among the Congolese public and politicians was justified by the idea that a division of labor was necessary between international justice bodies and the Congolese judicial system. The highest ranking leaders linked to the most serious crimes, including foreign nationals, would appear before international justice mechanisms, given the incapacity of the Congolese justice system to prosecute them. The Congolese justice system would use the respite gained in order to reform its internal structures as well as to prosecute people in lower-ranking positions. In the following months, however, the exact opposite happened. At the end of what appeared to be only a cursory investigation, the Court indicted people hardly thought of as bearing the highest responsibility for crimes that were not among the most serious committed in Ituri. The strategy Mr. Moreno-Ocampo was now implementing in Congo was moving away from the basic principles he had previously outlined. The prosecution strategy followed in DRC failed to follow the basic mechanism of complementarity it had proposed, and thus also undermined any chance of the Court fulfilling the objective, expected from any international criminal tribunal, of establishing a historical record that clearly identified those who were most to blame for the suffering of the Congolese people. Very few among the Congolese legal community and civil society expected the ICC prosecutor to go as high up as he later did in the Sudan case. There, his indictment of President Bashir, though the person bearing the greatest responsibility for crimes committed in Darfur, was rightly criticized for its potentially adverse implications to the peace process that was taking place at the time of the indictment. The DRC situation was different. There was no shortage of individuals who were not heads of state who bore a much greater responsibility for crimes in Ituri than the ones the ICC prosecutor eventually indicted. The strategic decisions the ICC prosecutor took early on in the DRC threw many in the Congolese legal and human rights communities into confusion and shook their views on the role and potential contribution they expected from the Court. The first disillusionment came with news of the indictment of Thomas Lubanga as the first person to be charged by the ICC. Lubanga was being prosecuted for crimes consisting of “conscripting and enlisting children under the age of fifteen” and forcing them “to participate actively in hostilities in Ituri, from September 2002 to 13 August 2003.”11 Both the choice of individual and the crime he was charged for were set to irreparably damage the effectiveness of the division of labor between the Court and the Congolese justice system. For most Congolese, Thomas Lubanga did not fit into the category of persons bearing “the greatest responsibility” for the crimes committed during the second phase of the Congolese war. A mid-level actor in the conflict in Ituri, Lubanga started his criminal career as an aide to Mbusa Nyamwisi, leader of the armed group RCD-ML (Rassemblement Congolais pour la Démocratie—Mouvement de Libération) which controlled Ituri between 1999 and 2002 with the support of Uganda. A large percentage of the crimes committed in Ituri were committed by the RCD-ML, of which Lubanga was only one among several “ministers.” Only in the beginning of 2003 did he create his own militia, the Union des Patriotes Congolais (UPC), also with the support and at the initiative of officers of the Ugandan army. As was the case with most of the militia in Ituri, however, the UPC’s operations were under the effective strategic control of the Ugandan army, whose officers retained command and control of military operations, including those during which crimes were committed against the civilian population. In August 2006, the ICC also issued an arrest warrant against Bosco Ntaganda, former chef d’état-major général adjoint overseeing military operations of Thomas Lubanga’s militia, the UPC, for the same crimes as his former boss, conscription of children of less than fifteen years old.13 Proceedings in the case against Bosco Ntaganda have, however, not yet begun because Ntaganda, who has since become an officer in the government army, the FARDC, has not yet been arrested. The commander of a small armed group, the Forces de résistance patriotique de l’Ituri (FRPI), one of the components of the Front des nationalistes intégrationnistes (FNI), Germain Katanga had been appointed a general of the Congolese national army in December 2004 with six other warlords from Ituri, over the protests of the victims’ organisations and the human rights activists who gave evidence of their implication in criminal acts in Ituri. Ngudjolo, meanwhile, occupied a lower post in the leadership chain of armed groups in Ituri, having served under the orders of Germain Katanga in the FRPI. He had joined the Congolese army at the same time as Katanga, and was arrested by the ICC in January 2008 while he was attending an army officer training course in Kinshasa. Floribert Njabu, the political leader and one of the co-founders of the FNI, the movement in which Katanga and Ngudjolo were low-ranking officers, was held in a prison in Kinshasa at the time of the transfers of Katanga and Ngudjolo to the ICC, but was not himself transferred to the Hague. Even if the FNI was a movement of lesser scale than the RCD-ML, for example, Floribert Njabu better matched the profile of “person bearing the largest responsibility” for crimes committed by this armed group than either Katanga or Ngudjolo. The ICC’s failure to bring charges against high-ranking commanders and for the most serious crimes was a direct result of the prosecutor’s strategy of conducting quick investigations with the lowest cost possible. From the outset, the office of the prosecutor (OTP) invested only in low-intensity and short investigations in Ituri, relying on the cooperation of the Congolese government and the UN Mission in the Congo (MONUC) rather than on collecting direct victim testimony or using the material already collected by local NGOs for information on crimes and analysis of the cases. This system would eventually form the default operating protocol in the OTP and lead to investigative disasters elsewhere in the DRC, and in other countries, along the same lines as what I believe has become the fiasco of the Lubanga case. It would appear that investigations were never at the top of the ICC prosecutor’s agenda from the time of the establishment of his office. While he devoted considerable efforts and resources in establishing the impressively bureaucratic Jurisdiction, Complementarity and Cooperation Division, he also put in place administrative operations and policies that had the consequence of undermining the importance and professionalism of the Investigations Division. In December 2003, for example, the prosecutor told a group of international NGOs that the investigative teams deployed to the field would be composed almost entirely of temporary staff. It was only after strong objections from some of those NGOs and senior staff in his office that he agreed to reconsider this initial plan.20 Among arguments put forward to counter the prosecutor’s initial plans was that from the experience of other international tribunals, expertise in field investigation and proper analysis of information and evidence, which is the foundation of a sound prosecution strategy and solid indictments, would not be easily obtained through lightweight, undersized investigative teams. 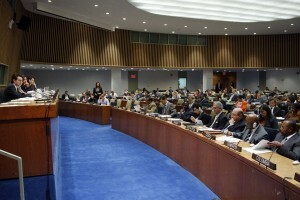 To be fair to the prosecutor, cost efficiency was part of the agenda that major state contributors were pushing both bilaterally and through the Assembly of States Parties (ASP) to the ICC, with some threatening to withhold or cut contributions unless clear cost-efficient policies were articulated by the OTP and other organs of the Court. The principle of an independent prosecutor, however, meant that such efforts by states parties to the Rome Statute could only concern decisions of a non-judicial nature.23 Indeed, in making the case for his hit-and-run investigations policy, the prosecutor was careful not to emphasize too much the cost-efficient argument, insisting instead on a range of other factors, such as security on the ground, quality of analysis of the situation, and the value of state cooperation. In addition to security conditions, he also thought state cooperation was more important than the size of the investigative teams or the time they spent on the ground. “What we learned in comparing Uganda and Congo,” he explained, “is that our life was different in Uganda because the government was more involved. We have worked longer in Congo and have less information, we need to improve cooperation [with the DRC state].”25 Since the DRC government and other state institutions such as the newly integrated army were populated with some of the individuals who potentially bore the greatest responsibility for the crimes committed in Ituri, such a strategy was a recipe for failure. Two years into the investigation, while donor states, human rights groups and victims’ associations were impatiently waiting for the OTP to bring its first indictments, the situation was as follows. The cooperation with the DRC state on which the OTP had relied was so poor that it could not, on the prosecutor’s own admission, elicit enough quality information on the most serious crimes committed in Ituri to bring solid charges against those most responsible. The investigative teams assigned to the Ituri situation were too undersized and too short-term to generate good analysis of the intricately entangled criminal activities in this bloody part of Congo. Local NGOs and activists, who had more raw intelligence on the crimes than any other entity, were deliberately sidelined and their invaluable expertise not fully integrated into the investigative process. In such a situation the OTP was left with no other choice than to bring the most “manageable” charge for the short prosecution he envisioned. It is this difficult position that led to the investigators having to rely on “intermediaries” for the identification of potential witnesses and the generation of contextual analysis. Much of the delay of the Lubanga trial was due to the heated debates between the prosecution and the defense over the credibility of evidence generated through intermediaries. The Court devotes a good chunk of its judgment to the issue of intermediaries and dismisses some of the evidence produced through the intermediary system as weak and full of contradictions. In the end, therefore, what was meant to be a short and cost-effective investigations strategy ended up causing unnecessary delays in the Lubanga trial and almost caused the prosecution’s case to be thrown out. It was the prospect of a division of labor between international and national justice and the promise of international support to the reconstruction of the national justice system that attracted most in the Congolese legal community towards the ICC. The cooperation agreement between the ICC and the government of the DRC concluded in October 2004 provided for the possibility for the OTP to “cooperate with the [Congolese] courts and provide assistance to them for […] investigations, prosecutions, and any eventual trials for crimes that fall within the competent jurisdiction of the International Criminal Court.” The ICC prosecutor also committed to, “as far as possible, facilitate such assistance by third parties.”26 Immediately after the signing of the cooperation agreement, the Congolese Procureur général de la République (the chief public prosecutor) established a section in his office with a team of senior prosecutors in charge of the implementation of the cooperation mechanisms provided under the agreement. This cooperation mechanism, however, has worked as a one-way street in favor of the ICC. While the ICC prosecutor has enjoyed unlimited access to the judicial proceedings before national courts in accordance with Article 36 of the ICC-DRC agreement, no Congolese court has been given information in the ICC’s possession relevant to crimes being prosecuted in national courts.27 Moreover, the ICC has not provided national courts with the much-needed training in prosecution of complex mass crimes, even though national prosecutors and judicial police officers have consistently identified such training as a prerequisite for a more efficient fight against impunity.28 Nor has the ICC prosecutor’s commitment to helping with international assistance for the rebuilding of the Congolese justice system materialized. Moreover, it would appear that by taking cases away from national courts, the ICC’s intervention has, in fact, hindered progress towards the rebuilding of a functioning national justice system. All three militia leaders currently in the ICC’s custody were being prosecuted or had been indicted by Congolese courts at the time of their transfer to the ICC. Two of them, Thomas Lubanga and Germain Katanga, had been arrested following the murder of nine peacekeepers from the MONUC’s Bangladeshi battalion in February 2005 and charged by Congolese military prosecutors on different counts of looting, crimes against humanity, and war crimes. Until his surrender to the ICC on 17 March 2006, Lubanga had been in custody of the prosecutor of the Kinshasa Haute cour militaire (Military High Court), the highest military court in the land, but had not appeared before the court. Katanga had been arrested in March 2005 and a formal investigation file had been opened by Colonel Tsino, a Haute cour militaire investigative judge, against him and seven other militiamen.29 During his appearance before the investigative judge on 20 January 2006, Katanga was asked specific questions in relation to crimes committed during the attack on Bogoro in 2003—with which he and Ngundjolo were eventually charged at the ICC.30 Six months prior to his surrender to the ICC in October 2007, he had appeared before the Haute cour militaire in Kinshasa, which ruled on his application for conditional release by directing the military prosecutor to complete his investigations and bring the case to trial without further delay.31 Katanga was eventually transferred to the ICC before the investigative magistrate could complete his investigation. The long delay in bringing his and Lubanga’s cases to trial since they were arrested in 2005 was in part due to lack of training on the part of military investigative magistrates in investigation of complex crimes of an international nature.32 Nonetheless, the initial work in their cases had already been completed, enabling the prosecutor to take credit for bringing new cases without doing the hard work of investigation that should have established the basis for charges. This sort of selective and scattering reading of history exposes the Court to the accusation that it has avoided the difficult task of confronting more powerful political individuals in the region and, therefore, that it has succumbed to a political or ideological instrumentalisation that is incompatible with its independence. It also distorts history by leaving the impression that the alleged crimes of Lubanga and other rebel leaders were motivated only by ethnic identity, and thus reinforces the lazy and inadequate image of “tribal warfare” portrayed by Western media who do not take the time to learn about the political and economic causes of those wars. The strategy adopted by the prosecutor has led him to give priority to the views of states and the demands of international organizations over the needs of the victims. The concept of “positive complementarity” has resonance in the West among the representatives of international human rights organizations. However, its implementation was frustrated by the obsession with the need to obtain the cooperation of the states where the ICC’s investigations were taking place. The idea to set up small investigation teams and to deploy them for short periods was applauded by the contributing states and the international agencies impatient to see the beginning of the first trials. Yet the emphasis on cost-saving prevented the investigators from spending essential time with the victims and reigniting their faith in the international justice system. It is yet to be seen how these victims will have their faith strengthened by the first judgment of the International Criminal Court. to see your post. Thanks a lot and I’m taking a look forward to contact you.